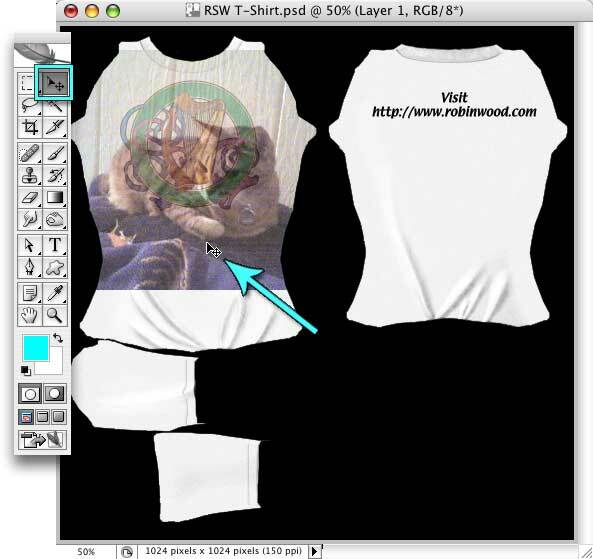 Years ago there was a discussion on the Second Life forums that inspired me to make a true T-Shirt template, so everyone who wanted to could make a t-shirt quickly and easily. It was originally intended to let people who just wanted a single t-shirt, for an event, or to promote their favorite band, sim, or soft drink, to make one. It wasn't for people who wanted to really learn to make clothing in SL, although I'm delighted that it's helped with that, too. But there will be no templates for other clothing types, because if you want to learn to make clothing, you need to make your own templates as well. There's a read-me file in the package, but if you want more instruction about how to use it, read on! 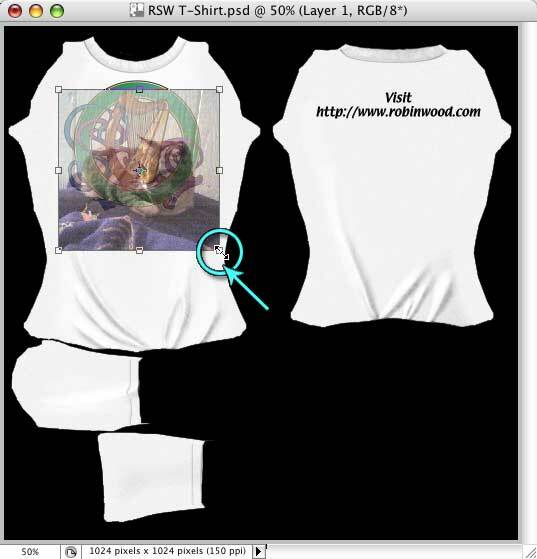 NOTE: In order to use this tutorial you MUST download the "Robin (Sojourner) Wood T-shirt" file. 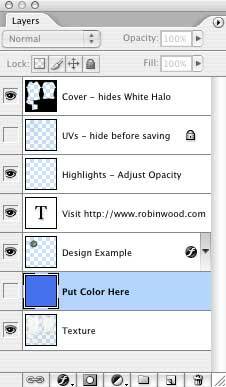 I'll be referring to layers that are in that file, and if you don't have it, you won't be able to follow along. Note that the "templates" provided by the Lindens, Chip Midnight, and myself aren't actually templates at all. They are UV Maps. This shirt is actually a template. It's all finished, including the Alpha Channel, so all you need to do is slap a picture on the front, change the color, and upload. These instructions will tell you how to do that, and nothing more. It was not designed to teach how to make a t-shirt from scratch, although you are certainly welcome to reverse engineer it and figure that out. These instructions are written for Adobe Photoshop, with screen shots from PS CS2. If you use something else, you will have to translate the instructions yourself. Please don't write and ask me to do that. I can't. The only raster programs I know how to use are Photoshop and Painter. When you open the file, you'll see a number of layers. If that confuses you, it's okay. None of us were born knowing about layers! Just click here to find out what Layers are. If you are comfortable with layers, then we can start to place your image. Tap Command/ctrl C to copy the image. 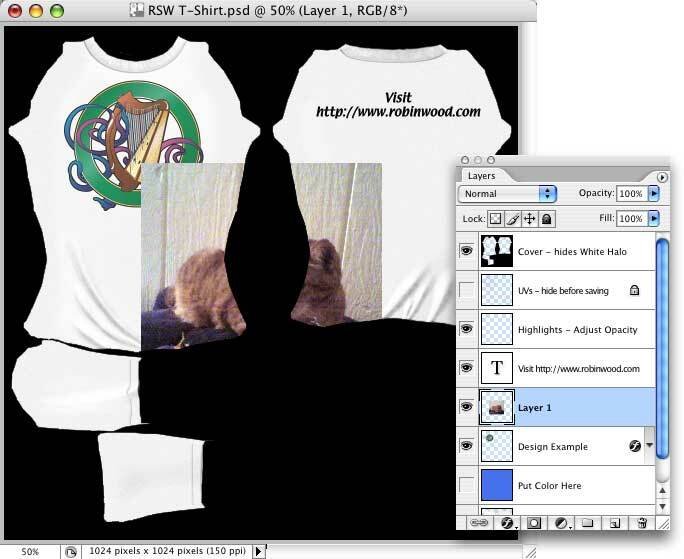 Click on the window with the T-shirt in it, to make it the active one, and then click the Design Example layer to select it. 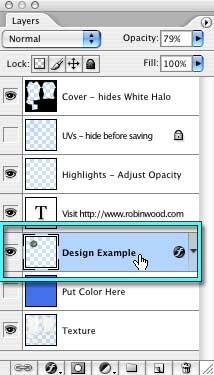 New layers always are added above the currently selected layer, so doing this determines where our new image will be in the stack. Tap Command/ctrl V to paste. 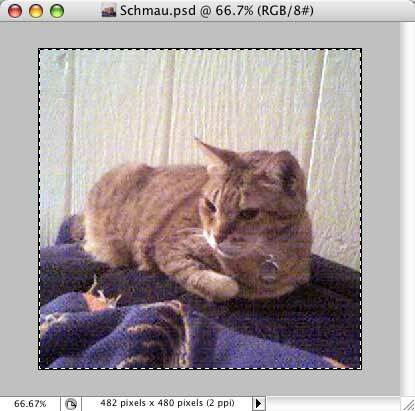 Your picture will appear in the middle of the image, on its own layer. Because it's in the middle, it will be under the Cover layer, and partially obscured, but that's okay. We'll reposition it in a moment. 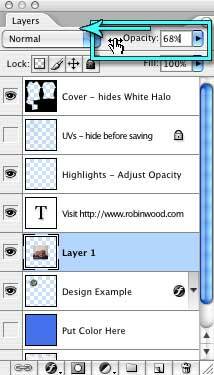 Notice that the new layer, Layer 1, is already selected. (It's highlighted.) This is good, because we need to work with it for the next few steps. Make sure that it stays selected. We're going to use the Design Example to get the placement right, but it would be easier if we could see through the picture we just placed there..
With the new layer (Layer 1) still selected, tap the V key, to get the Move tool (or select it from the toolbar,) click anywhere on the image, and drag it into position in the middle of the shirt, over the harp. Tap the T key, to move into Free Transform mode. (Or choose Edit > Free Transform from the menus.) Now, hold down the Shift key, to constrain resizing to proportional only, and the Option/alt key, to resize from the middle. Click one of the corner handles, and drag inwards, towards the center of the picture, to shrink it. Now, if you are happy with it this way, you can just change the Opacity back to 100% (the quick way is to tap 0 (zero) on your keyboard or numeric key pad,) click the Eye icon next to the Design Example layer, (to hide it,) and skip to the next page. But I'm going to do a little more with it, just to show you what is possible. First, I'm going to make the picture round, not square. Click where you want the center of the circle to be, hold down the Shift key, to constrain the marquee to a circle (otherwise, it makes all kinds of ovals,) and the Option/alt key, to make a marquee from the middle (notice a pattern here?) and drag the marquee out, until it's roughly the same size as the circle around the harp. 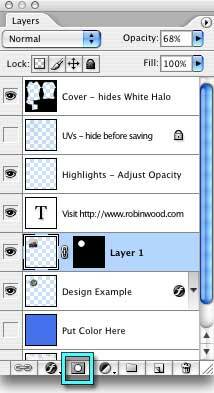 Now, click the Make Mask button, at the bottom of the Layer palette. It's the one that looks like a square with a circle in the middle of it.) You'll see that the edges of the image disappear. They are still there, but now they are hidden, or masked. You'll also see another thumbnail in the Layer palette, next to the image thumbnail. This one is black, with a white area where the image is. This is the Mask thumbnail. Now, let's add a layer style to the image, to give it a little snap. 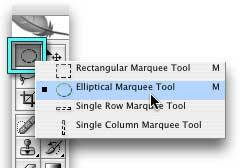 Choose a style by clicking on its name on the left side of the palette. When you do, the options for that style will fill the dialog. If you have the Preview enabled (on the right side of the dialog,) you can see the results of the style as you play with the settings. I'm using both a Stroke and a Drop Shadow. I'll just keep the defaults for the Stroke. 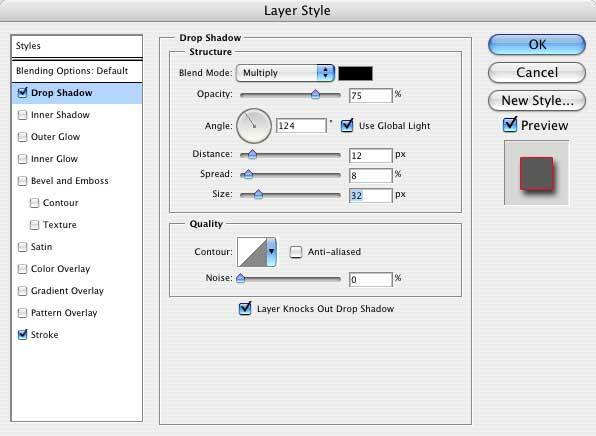 For the Drop Shadow, I'm going to use the settings shown here. Let's move on to Page 2, and we'll finish up.